How are the last few days of 2016 for you? What did you learn about yourself? How did it challenge you? What did you gain? And what did you give? Its time for a little reflection some end of year rituals! Upon reflection, 2016 has been an amazing year of change. Whether it was something I had never done before or whether it was something that my soul had been pulling me towards for such a long time, 2016 was an incredibly energetic year - so much momentum and so much creativity was birthed this year and for that I am truly grateful. I have some end of year rituals that you can try. I have also created a few Journal Sheets for you today to do some reflecting and create a ritual to complete the year and move into 2017. 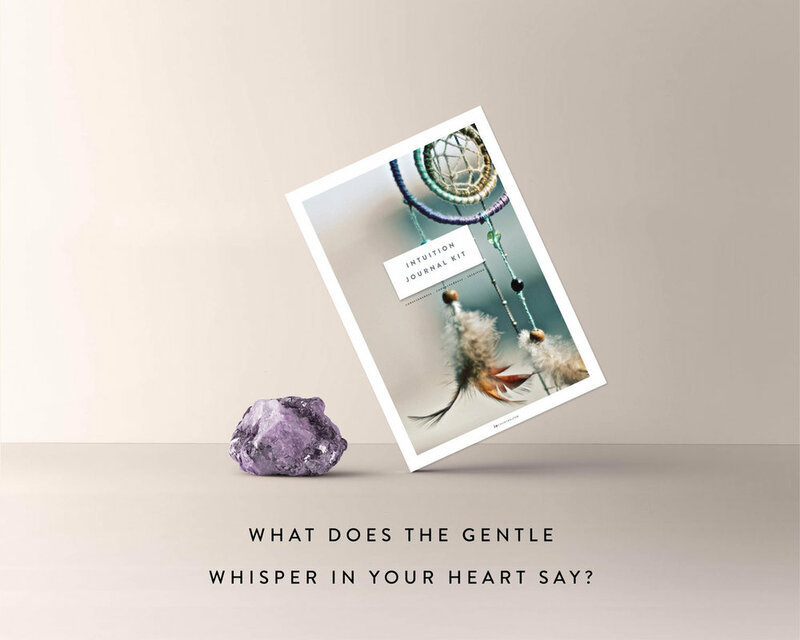 You can download the Journal Sheets by signing up for the Free Resource Library - The Intuition Collection. Or you can also simply put pen to paper and write out your thoughts to the Journal Prompts below in your journals too! Sign up to access these journal sheets here. Light a few candles, burn some incense or clear your space with white sage. You could hold a crystal in your hand. Make this space comfortable, quiet and still - set the scene for how you want to close your year. Keep your journal or your Journal Sheet templates with you. Spend a few minutes in quiet meditation and soak up the energy of this sacred time of the year. How does this energy feel? What emotions and images come up? Where in your body is your attention pulled towards? What energy or feelings lie in this part of your body? Why? What does the energy of the new year feel like? Capture your thoughts in your journal or you could use your Meditation Journal Sheet from the Intuition Journal Kit too for this exercise. You can use the FREE End of Year Reflections Journal Sheet for this. Or in your journal, write down each area of your life and your thoughts, feelings, experiences that moved you for this area. Use the End of Year Reflections Journal Sheet. You can use the FREE New Year Intentions Journal Sheet for this. Its a beautiful time for appreciating the completion and a beautiful time to set your intentions for the year ahead. These don’t have to be New Year resolutions, but simply an intention or energy that you wish to hold for the year ahead. Write down a list of your goals for next year, whilst exploring exactly why your soul wants this for you. Does it make sense for your higher purpose and how much will it move your soul to lean towards this goal or intention. Gabrielle Bernstein has some amazing advice for setting new year intentions and showing up for your resolutions. Read about them here! What did you learn? What did you accomplish? What are you grateful for? You can use the FREE 20 Things Journal Sheets for these. What did you learn about yourself? How did your soul grow? How did it push you to sit with the uncomfortableness of it all? What were your biggest challenges and most amazing moments? What were the moments that made your year? What do you hold gratitude for? What do you need to release and let go of? What habits do you need to do less of in the following year? You can use the FREE I Am Letting Go Of Journal Sheets for these. Release it all with love and grace. Accept that these habits, perspectives or ways of thinking has taken you so far. What do you need to do for yourself to heal from or release this? You may like to write this and then burn it to release the energy it holds. It is time for you to transcend from these experiences to something new. Here is another Pagan Inspired Cleansing Ritual to help your release and clarify your blocks for the new year. In Japan, one of the rituals that is done before the end of the year is 大掃除 (osouji) which is a deep clean. The ritual of purification, cleansing and decluttering is a custom that many households partake in as a symbol of welcoming in the new. In Shintoism, the religion that is widely practiced in Japan, the priests perform a ritual called the susharai in December where dust is cleared and the shrines are purified for the year ahead. So welcome in the new year with a little spot of decluttering, donating the things you no longer need, and cleaning. You could do this for your home, your work space and even computer as well. I love the feeling of starting the new year fresh, having filed my emails and documents into archives. I love this manifestation ritual which brings your energetic vibration to a space that you want to hold for the new year. Pull a card for every month going into 2017 and write down your thoughts for each month. Keep this with you and refer back to it during the year. This is a beautiful little exercise to play with your intuition. WHAT IS YOUR MANTRA FOR THE YEAR AHEAD? How do you want to feel moving forwards? What are some mantras that you will hold for yourself in the year ahead? These are different to New Year Resolutions or goals in that they are defined by the way you intend to show up - how do you want to be? This is such a perfect time to do Danielle Laporte's Desire Map and refresh your core desired feelings or you could find inspiration from these mantras and tweak them to make them your own. Thank you so much for being such a beautiful supportive community over the last year - its been absolutely amazing to have connected with so many of you and I am truly grateful and excited to move into the new year with you. What are some of your end of year rituals and new year intentions? Leave me a comment below!